This Tuesday, as I'm sure you are aware, is the US Presidential Election and also elections to the US Senate. What you might not know is there is no standardised time - even per time zone - for polls to close; something that Europeans won't be used to. Another thing that might surprise you is that the media will often not bother waiting until the votes are counted before announcing who they think will win a particular state in the presidential election - this is known as "calling" a state for a particular candidate. Television networks rely on polls from key districts (not unlike the exit polls we have for general elections here in the UK) to determine the winner of a state, and unless that media organisation thinks there's a decent chance of them being wrong, they will call the state for one candidate over the other. If it isn't clear, they will say the state is too close to call and wait for more data to become available. This initial call is taken at the moment that all the polls have closed in that state (individual polling stations may not close at the same time throughout that state). Therefore it is useful to have a guide of when the polls close so that you can be ready for when each state is called - or not at the case may be. 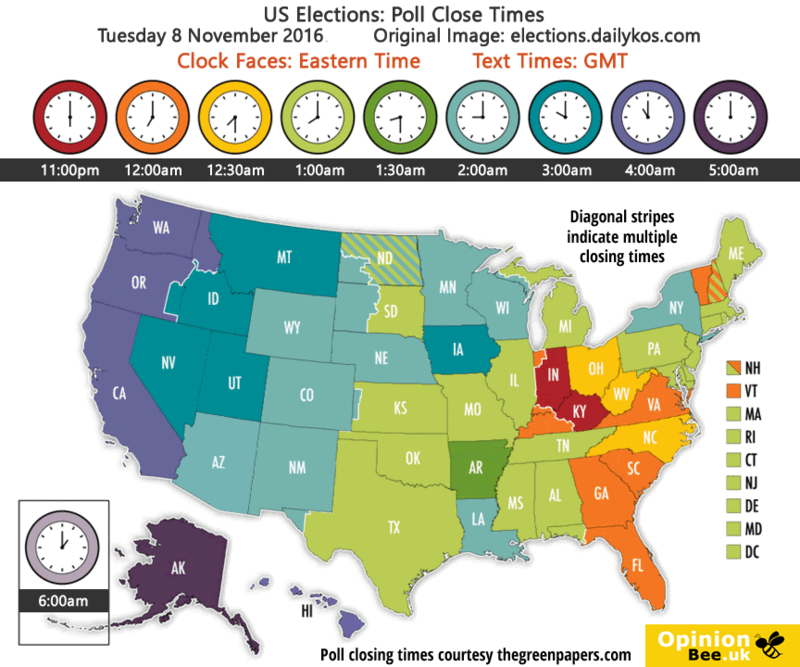 The following is a useful map of times polls will close in GMT. This is a modification of an original image from Daily Kos.